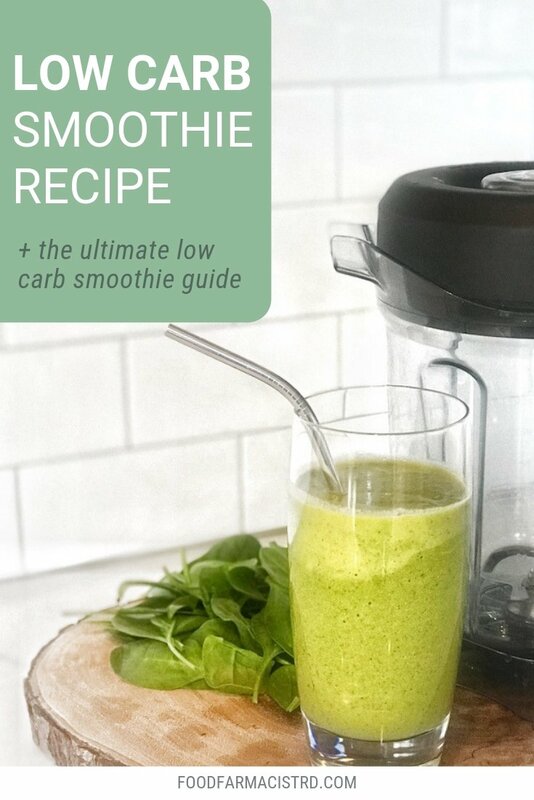 If you find that most smoothies leave you hungry and unsatisfied – you’ll love my favorite low carb smoothie recipe that does just the opposite! Confession: I used to be a smoothie hater. For one, I would make a smoothie in the morning, and be hungry like 1 hour later. WTF? As a result, I would find myself craving sugar more often throughout the day and eating larger portion sizes at my meals. Too little protein, fat, and fiber. Sure, the sugar in the bottled smoothie comes from fruit and has some vitamins and minerals. But, at the end of the day, our body processes excess sugar in the same way (especially in the absence of protein, fat, and fiber). 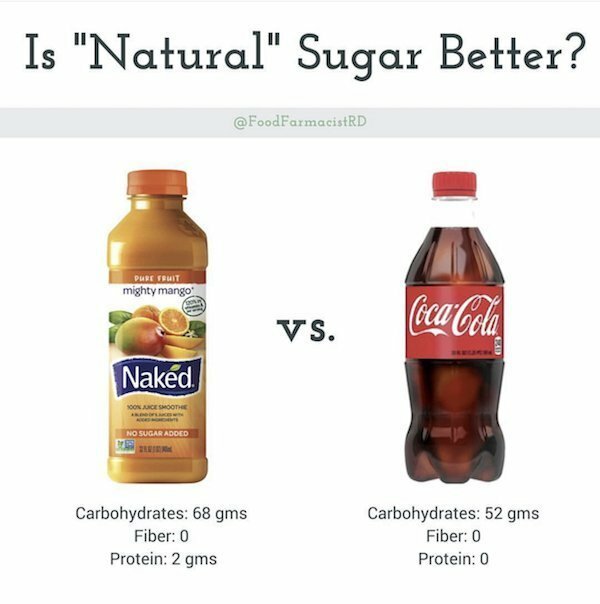 In this example, the Naked smoothie bottle has MORE carbohydrates than the Coca-Cola! But just to be clear, carbs aren’t “bad”. However, we do want to have a healthy balance of carbs, protein, fat, and fiber to help regulate our blood sugar, weight, cravings, and more. Too many carbohydrates in one meal or snack will spike your blood sugar, and cause a subsequent “crash” 1-2 hours later – leaving you hungry and craving quicker absorbing carbohydrates (usually in the form of sugar cravings). As a dietitian specializing in functional nutrition, I recognize that there is definitely evidence to suggests the health benefits of a low-carb diet for various conditions, as long as it’s done correctly. This means that you should be including lots of high-quality fats and protein to keep you full. You should also include as many non-starchy vegetables as possible! If following a lower carb diet, eating enough fiber from low carb fruits and non-starchy vegetables is key! Most people forget to add enough fat, protein, and fiber to their low carb breakfast smoothies. Here’s an easy guide that I like to use when inventing various low carb, high-fat smoothie recipes! This post contains affiliate links, which means Food Farmacist RD receives a percentage of the sale if you use the link to make your purchase. This does not change the price of the product for you! These are my own, honest opinions. Leafy greens, like kale, spinach, and arugula are great! Aim for 1 cup per serving (at least). With this graphic, you can easily modify your smoothie for any taste preferences, allergies, intolerances (like dairy free), and more! 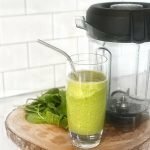 My Favorite Low Carb Green Smoothie: The Green Machine! 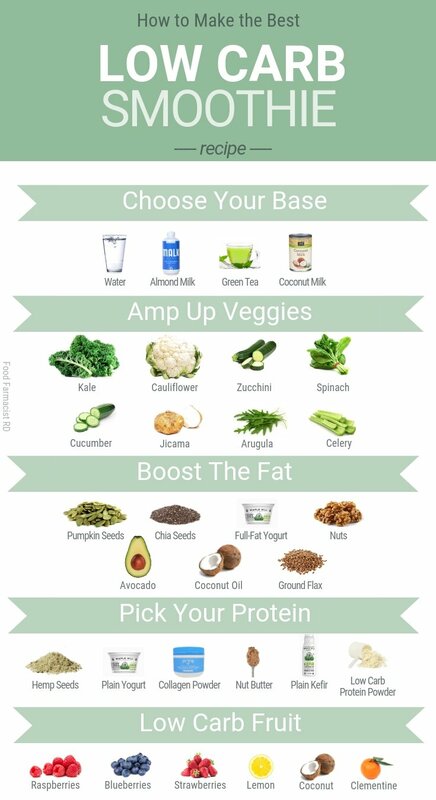 Once I started learning about real-food functional nutrition, I began experimenting with some different low carb, high fat, veggie-rich smoothie recipes. 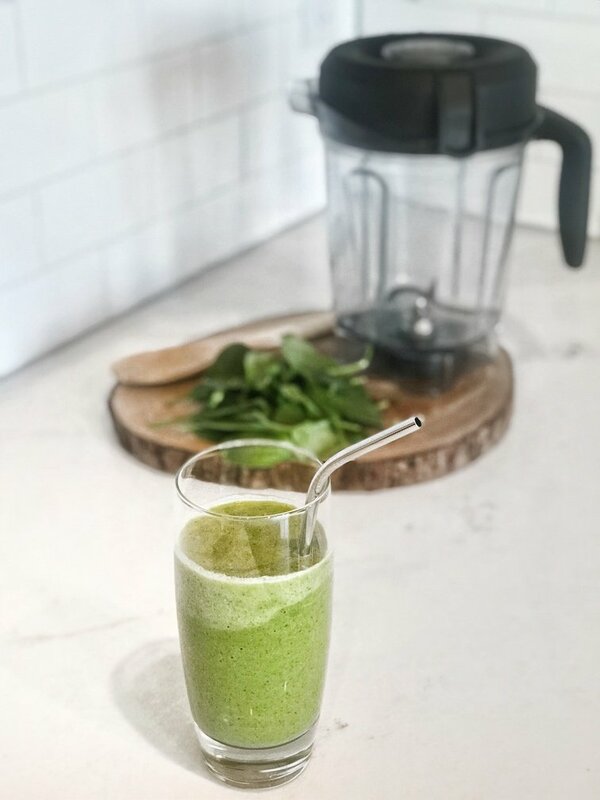 My favorite, go-to low carb smoothie is my Green Machine recipe! It’s rich, creamy, and results in a totally Instagram-worthy bright green color! 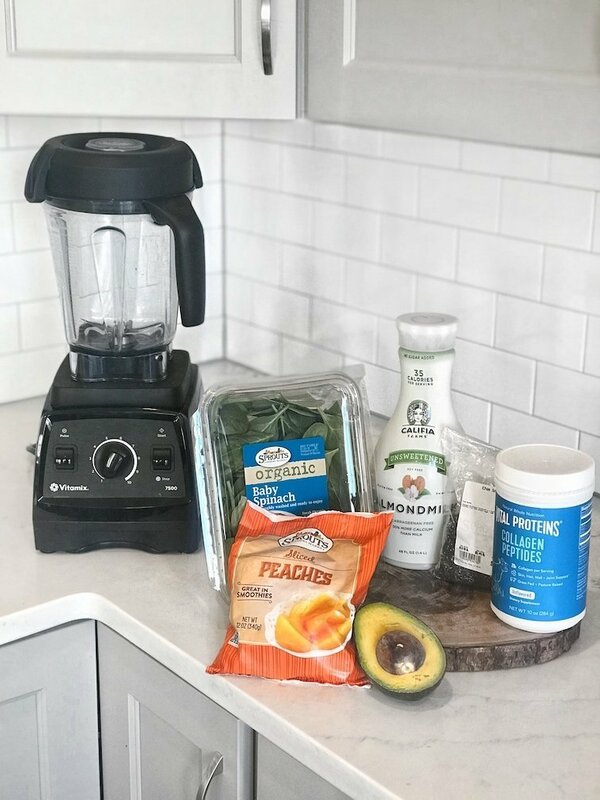 The ingredients you will need to make this no carb green smoothie are as follows: unsweetened almond milk (I love Califia Farms), chia seeds, organic baby spinach, sliced peaches, 1/2 large avocado (or 1 full small-to-medium), protein powder – I prefer Vital Proteins Unflavored Collagen Peptides. Collagen is a great source of protein for your skin, hair, nails, joints, and so much more. Two scoops of this unflavored collagen powder provide 20 grams of healing protein! I buy mine either online from the Vital Proteins website, or from my local health food store, Sprouts! You can also use any other vanilla flavored lower carb protein powder as a substitute, or plain greek yogurt (will require more liquid, however). If you’re just starting to reduce added sugar into your diet, you may need to slowly modify the sweetness of your low carb smoothie. As you may already know, it takes a little adjustment to modify our palate for lower sugar items. We are so used to added sugar in hidden items that slowly reducing it to adjust your palate may be required! For example, while I only use 1/2 cup of a low-carb fruit, my husband prefers a bit more (close to 1 cup) which is okay, too! My favorite blender to use is my 7500 low-profile Vitamix! Guys. This bad boy can blend frozen fruits like it’s no body’s business. In other recipes, I will often use halved cucumbers or lemons (WITH the skin) and my Vitamix can blend it up to a smooth consistency in no time. 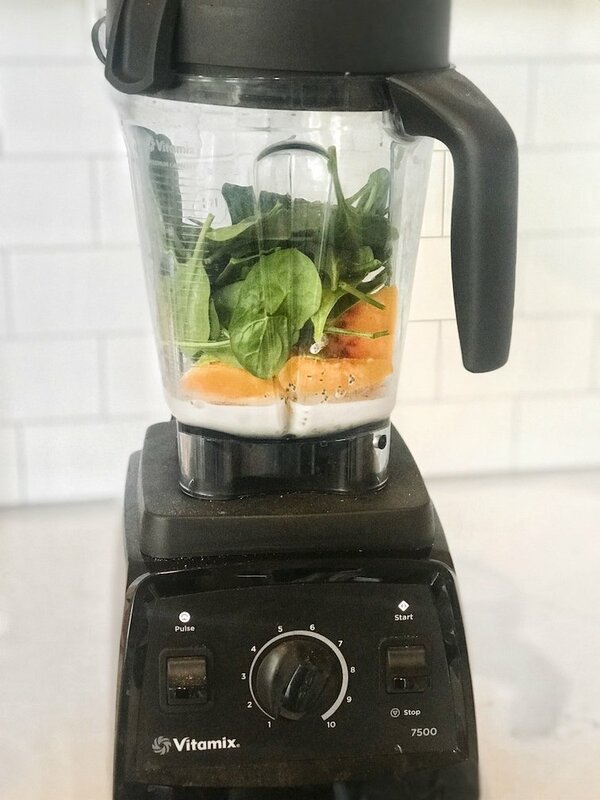 If you’re considering a high-quality blender, I recommend reading my Vitamix vs. Ninja Blender Comparison blog post. In order to blend to the best consistency, you will want to place the ingredients into the blender in the below order (from first to last). Add additional almond milk (1-2 tablespoons at a time) to thin to the desired consistency. I also have to touch upon these awesome reusable, metal straws!! If you love making breakfast smoothies, these are a game changer. You can reduce plastic waste, BPA exposure PLUS save turtles in the process! 😉 These stainless steel straws from Amazon also come with two brushes to keep them nice and clean. Add the almond milk, seeds, and collagen powder to the blender first. On top, add the frozen peaches, avocado, and raw spinach. Blend until desired consistency. Thin with water or additional almond milk, if needed. *You can substitute the collagen powder for plain greek yogurt, plain kefir, or protein powder if desired! 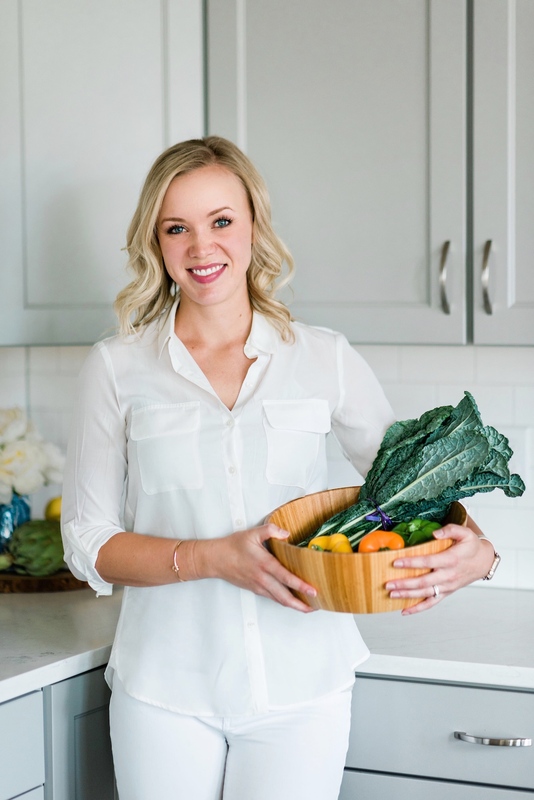 Maria is a mountain loving, real food focused, functional medicine dietitian and health writer. She helps people conquer sugar cravings using a whole-body approach.